Why not have the same arenas in Cards as in the normal Battles on that day? Additionally, the same type of club arena can work very differently in Cards versus Assault, so it isn't necessarily equitable to have the same club in both Assault and Cards on the same days, and it might make a weekly balance of arenas (not too much fast grinding) for cards arenas versus assault arenas extremely difficult or impossible. R3 is probably a lot faster than random Cards, and speed mega Cards used to be extremely fast, with games usually lasting around one minute and often less. Finally, there really aren't that many club modes, and NK needs to keep a lot of non-club arenas around so that players who haven't bought club access can play. So they'd might as well alternate the club modes on different days in Cards vs Assault so that people have more options, and fewer days where there's no clubs at all. This is especially a concern due to nearly all of the non-club arenas being powers-based now, and therefore unplayable or unenjoyable for many people. Doubling up arenas in Cards to have multiple MOAB+ arenas on the same day is probably a bad idea at this point, due to insufficient players to split between them. Oh, and we should also get more bosses :-) Currently we have 4 hours of Cards bosses of versus 9 for Assault bosses. Last edited by Valentijn; 25-02-19, 12:54 PM. As usual, NK has taken a good idea and implemented it in the worst possible manner. 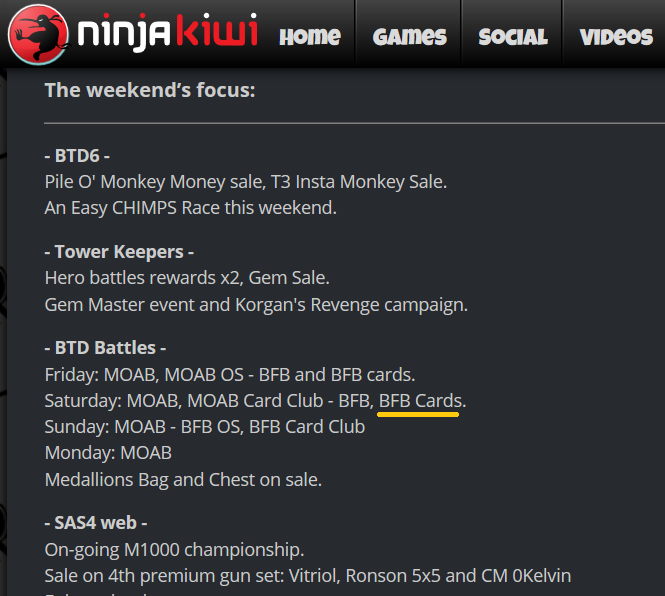 MOAB arenas have been added to Cards on Friday and Sunday in addition to the usual BFB's, and a BFB has been added to Saturday in addition to the usual MOAB. As discussed above, there are not enough Cards players to split them between multiple top arenas. Matching is now much slower, and it was pretty slow to start with. And of course, the extra arenas so far are all non-club normal arenas which rely on powers. Adding extra high-level arenas doesn't help if those arenas are really stupid ones which the vast majority of players don't want to play. BFB added on Saturday is the only improvement, but offset by being powers-based. I will literally never play those arenas again due to the intense frustration induced by constantly being forced to play late-game. After 5 games of that stuff I end up in Yellow Stadium rage-playing against n00bs while constantly BMing them, until the darkness in my soul subsides and is replaced by a gently pulsating loathing for the game and soft furry monkey shame. This has been yet another stellar example of not listening to the customers, resulting in a failure to understand what they're actually asking for, and implementing an "improvement" which just makes the situation worse. But do keep trying, guys. Either you'll randomly get it right eventually, or you'll continue accelerating the destruction of the game. Either outcome is fine with me at this point. I'm new but I'd just like to say how frustrating T4 powers as someone with T2 powers at best. Honestly though. Some powers are cool in that they're unique, but some like road spikes are utter crap. Wow, you get to pay hundreds of XP for 3 more spikes, isn't that awesome? And that rainbow rush which *should've* easily destroyed your opponent's pitiful defenses even with a tower boost? Nope, T4 spikes, have fun wasting your money. But to stay on topic, cards is a decent gamemode, if not repetitive after a while. My main issue is when your starting hand includes your most expensive cards, and when you trash them, you get them right back. Meanwhile your opponent has a million pinks coming your way. My main issue is when your starting hand includes your most expensive cards, and when you trash them, you get them right back. You get different cards for your first 14-15. New cards are only completely random after that. Game's dead though, NK's killed it off for good with the latest updates. Ah, that's at least a great mechanic to have. Props for that. I doubt the game's in its glory years but it doesn't seem "dead", per se, though declining - yes.